You just found your favorite album ever at a garage sale down the street, but there’s only one problem. It’s a record. And you don’t have a record player. If you want to grab something that doesn’t break the bank but still allows you to listen to your sweet vinyl, you need to be on the hunt for the best portable record player. Here are some things you can look for in a player. USB Enabled: If you want to be able to play not only records on your new music system, you need to be on the lookout for something that is USB enabled, so it can play music from your phone or rip you vinyl tracks to audio tracks. Headphone Jack: Not everybody likes Metallica ok? Sometimes you just need to throw on some headphones and have your own private jam session, just for you. BE on the lookout for this icon for systems with headphone jacks. 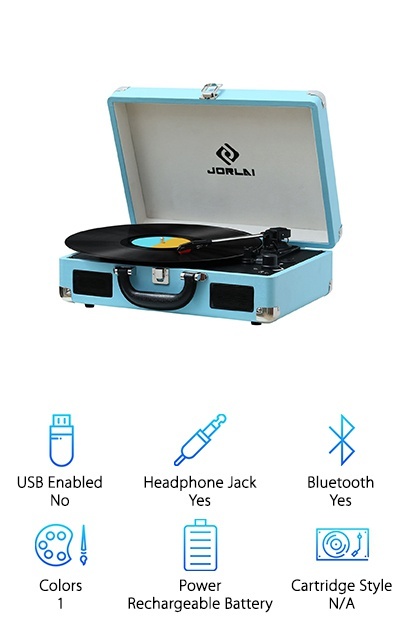 Bluetooth Enabled: Some players are Bluetooth enabled to allow you to use your record player’s speakers as a place to play music from your phone, computer, or any other device. This feature takes your record player to the next level. Colors: A record player is going to become a staple in your decor, so treat it like one. Choosing a record player that is stylish is almost as important as choosing a player that comes with lots of other features. Power: Some players are truly portable and come with a rechargeable lithium-ion battery that allows you to take your vintage party anywhere you see fit. Some people do only need their record player in one place though, so check this icon. Cartridge Style: There are a few different kinds of cartridge styles, but most portable models will be moving magnetic. This is an important feature if you’re really invested in how the player works, but for many users, this is not important. Alright, we think you’re ready. Let’s start to try to find you the best all in one record player. Our top and budget picks are great choices for anyone looking to pick a player quickly and easily, they are both great options. Read on through our other eight picks for the best portable turntable if you really want to be thorough. We hope you find something that rocks your socks off! Our top pick for the best Crosley record player is the awesome Crosley Nomad. It plays 7”, 10”, and 12” records, so you’re sure to be able to always play your garage sale finds. It comes equipped with an NP5 needle and a belt-driven turntable mechanism. It is USB enabled so you can connect it to your computer in case you want to use its awesome speakers for your other tunes. It even includes a software suite for ripping and editing the audio content off of your records, so you can get the sweet sound of records no matter where you are. The nomad is lightweight, at about 10 lbs. It looks great too. IT has a wood style cabinet with gorgeous vintage styled speakers on the side. The chrome snap closure completes the look and keeps your machine safe, even when you’re on the go. It plays 3 speeds, 33 13, 45, and 78 RPM records. Our budget pick, the Victrola Suitcase Turntable, is definitely the best budget record player in our books. It comes in fourteen colors- everything from pink camo to classic black. This sleek turntable is sure to fit any style and any place. It’s durable exterior and carries handle allow you to take it with you no matter where you want to jam. It even includes built-in Bluetooth speakers in case you don’t want to carry your records with you too. It comes with a three-speed turntable- 33 1/3, 45, and 78 RPM. It also includes an aux-in jack, if Bluetooth Isn't really your jam. 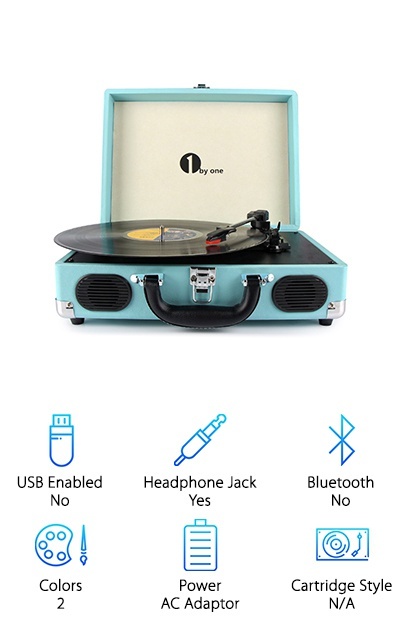 This makes it more than just a record player, but an all in one portable music device. 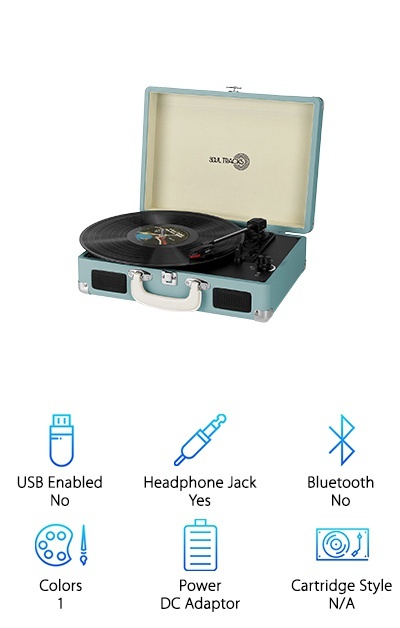 This is a great choice for anyone who wants a basic record player with all the features of a Bluetooth speaker without shelling out cash for both. Victrola is also one of the oldest names in records, so you know they’re good. 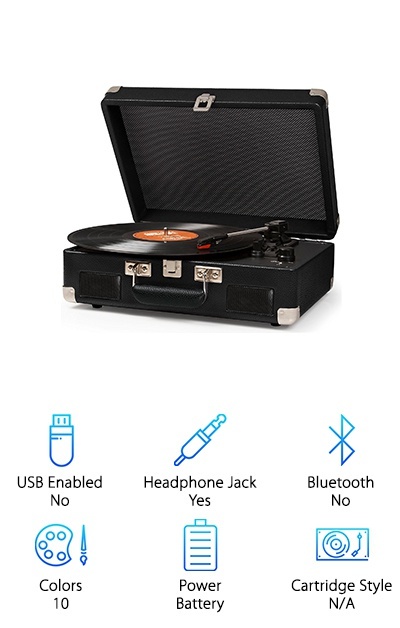 This is a great pick for anyone who likes their record players portable. Weighing in at only 5 pounds, this little record player really punches above its weight class. It comes in a convenient briefcase style with a carrying handle at the top, so your records can go wherever you do. The vintage styling doesn’t stray too far from the purpose of this amazing machine. It comes in two colors- a turquoise blue and jet black. The PU leather exterior gives it the appearance of being expensive without weighing too heavily on your wallet. The front-facing speakers provide amazing sound quality, whether you’re listening to your records or through the included RCA/AUX jack. This makes it easy to listen through your headphones, the included speakers, or whatever home speaker system setup you have. This is a standard three-speed record player, meaning it can play pretty much anything you have in your library already. This is a great choice for anyone scouring our portable record player review for something that’s truly portable. This belt driven turntable comes equipped with a rechargeable lithium-ion battery that allows you to take it with you anywhere. Ever wanted to camp out under the stars with a copy of your favorite record? Take your record player for a picnic in the park? This awesome KORLAI record player makes all of those dreams possible. When you’re inside, this player runs on an uninterrupted AC power supply, but it will stay charged up for your next adventure. 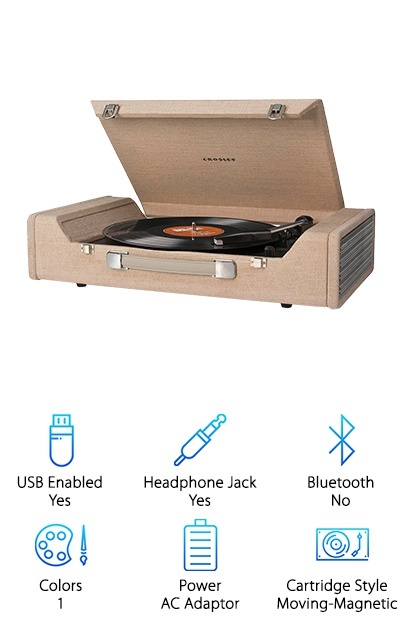 This record player is also a great choice for anyone looking for an all in one player, as it has an AUX jack and Bluetooth capabilities. This little 7-pound player really packs in the features for such a small machine. JORLAI also provides a 12-month warranty, just in case it breaks, how cool is that? A true legend in the world of portable turntables, the Crosley Cruiser is a great choice for anyone looking for a great basic player that doesn't break the bank. Plus, it looks good doing it. This awesome little player comes in 10 colors to suit any style. One style even zips up like a bag and has a strap you can sling over your shoulder, so you can really take your music everywhere. The other styles are leatherette in olive, hot pink, black, purple, grey, navy, red, coral, and turquoise. This is a great choice for anyone not only looking for a great portable record player but a stylish one too. This player is battery powered, so it is another great choice for anyone craving true portability. It’s a standard record player, playing three speeds. So even your friend's super obscure record by a band you’ve “probably never heard of”? Yeah, it can play that. In a field. Or an apartment. 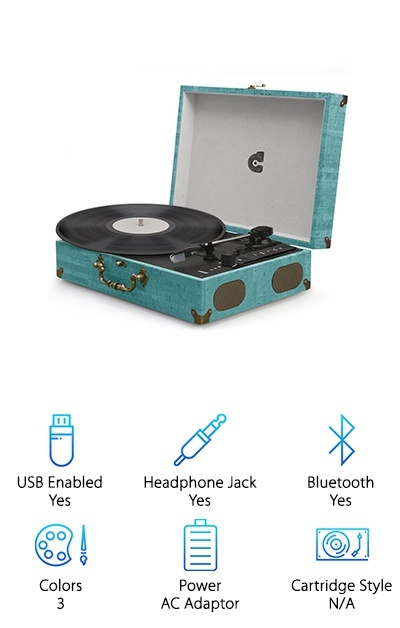 If you’re looking for something with a really unique style, look no further than the CMC Portable Bluetooth 3 Turntable. This is a great choice for anyone looking for a really vintage styled player. When it’s closed it looks like a cool treasure box that’s fallen through a time warp. 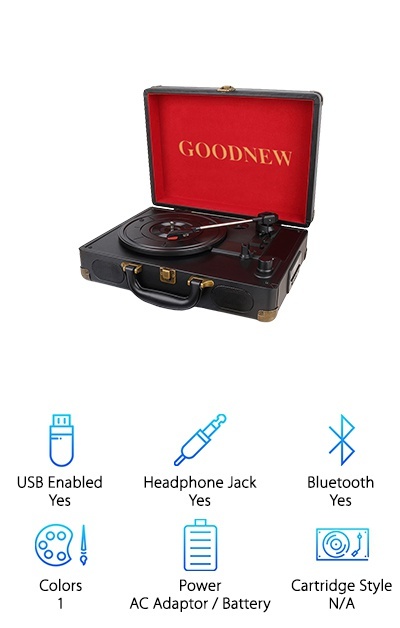 Open it up though, and it’s the powerful all in one player you’ve been searching for portable record player reviews for. It comes in three colors- black, cork, and blue. It is a classic player with the ability to play all three record sizes and speeds. It comes with built-in speakers on each side of the player for maximum sound output. It is lightweight, at around 7 lbs. This is a great feature because it means you can carry it with you everywhere you go, even to your friend's house to show them all your new records. It comes with a headphone jack and an RCA output. 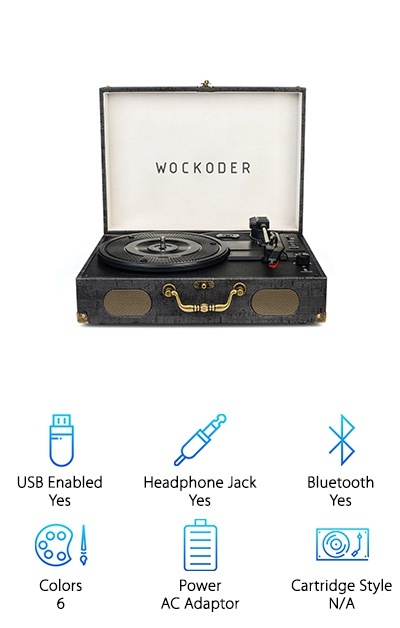 Another standout style wise is this Wodocker portable turntable. It comes in six colors, in case you needed a little more personality with your player. It comes in two shades of red, a light and dark blue, a cork color, and black. It doubles as a Bluetooth speaker, meaning this player isn’t just old school, it’s the master of all your music, no matter the era. This classic turntable plays any and everything you’ve been dreaming of. It can play at three different speeds- 33 ?, 45, and 78 RPM. It also plays 7”, 10”, and 12” records, so no matter what you dust off from your parent's basement, this record player will play it wonderfully. This is a great choice for anyone looking for a great portable player to supplement something like the Jensen JTA-230 review. This player can connect through an AUX jack or an RCA out jack. It weighs in at only 7 lbs. This is another great option for those seeking the truly portable. This turntable comes with a rechargeable battery that allows you to take it anywhere you go. It comes with some bonuses too, like a replacement stylus needle and a 12-month warranty. This is a three-speed record player, which means it can play anything you’re dreaming of. It has built-in speakers, and an RCA output, just in case you need more power than this little beauty can provide. This also comes with a headphone jack for your own personal record enjoyment. The real standout about this turntable is that it has MP3 recording capability. 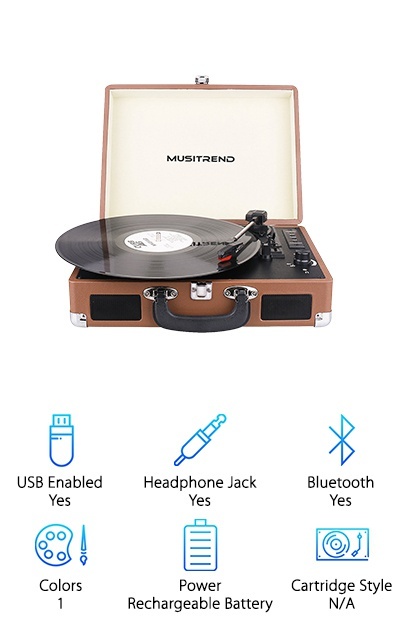 You can record high-quality MP3 audio from your turntable and carry the sweet sound of vinyl with you no matter where you go. It has an SD slot for recording and transferring your files quickly and easily. This is a great way to show off your amazing records in places where you can’t take your player. This is one of the best portable turntables for anyone craving a record player that can do it all. This player has a plinth that is made of stainless steel, so it can protect your record flawlessly from any damage. The heavier platter means it is more stable and vibrates less during playing, so you hear your record, not chattering. This player has front-facing stereo speakers that provide great sounds. This portable player is truly portable and comes equipped with a rechargeable battery that allows you up to three hours of on the go listening. This player also comes with USB, Bluetooth, and SD inputs, so you can use your player however you want. It allows you to easily transform audio from your records to MP3s, making even your music truly portable. The RCA output means that you can always plug it into stronger speakers if you want to be surrounded by your music. This is a great choice for anyone looking for a truly awesome player. It’s made by Photive and titled the SoulTracks for maximum nostalgia. It plays all three speeds and sizes. It comes with built-in stereo speakers for great sound, providing you with an awesome listening experience. This player really takes you back. Even if you weren’t there in the first place. It comes with a belt-driven turntable mechanism in a chic, briefcase style package. This style comes with a carrying case to make it easy to transport from place to place without placing it awkwardly under your arm and hoping it doesn’t fall. It has an auto-stop tonearm, so your needle won’t run over your record when it’s finished. It has RCA audio out, for plugging it into more powerful speakers. It also has a headphone outlet for creating your own little record oasis. This is a great little player, weighing in at 7 lbs.